Letter to H.E. 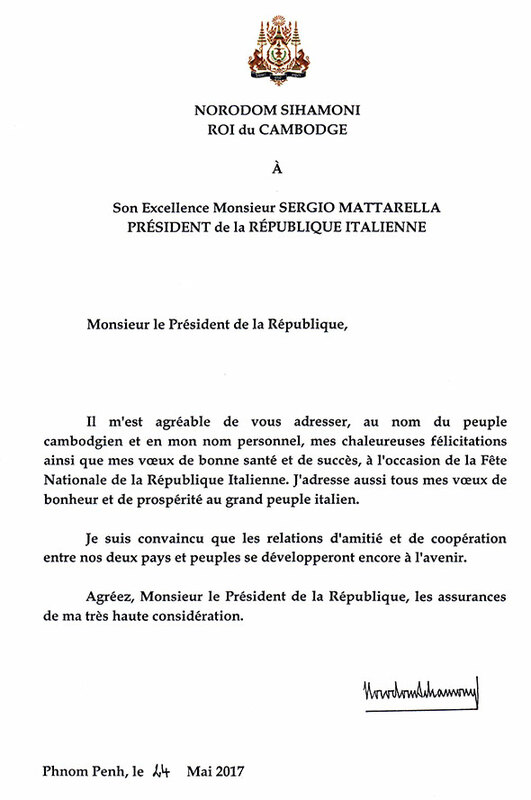 Mr. SERGIO MATTARELLA, President of the ITALIAN Republic . Letter to The Right Honourable Bidya Devi Bhandari, President of the FEDERAL DEMOCRATIC REPUBLIC OF NEPAL. Letter to H.E. Mr. ILHAM ALIYEV, President of the Republic of Azerbaijan. Letter to His Majesty ABDULLAH II IBN AL HUSSEIN, King of the HASHEMITE Kingdom of JORDAN. Letter to H.E. Mr. EMMANUEL MACRON, President of the French Republic . Letter to H.E. Mr. Moon JAE-IN, President of the Republic of Korea. Letter from HM Queen-Mother NORODOM MONINEATH SIHANOUK.